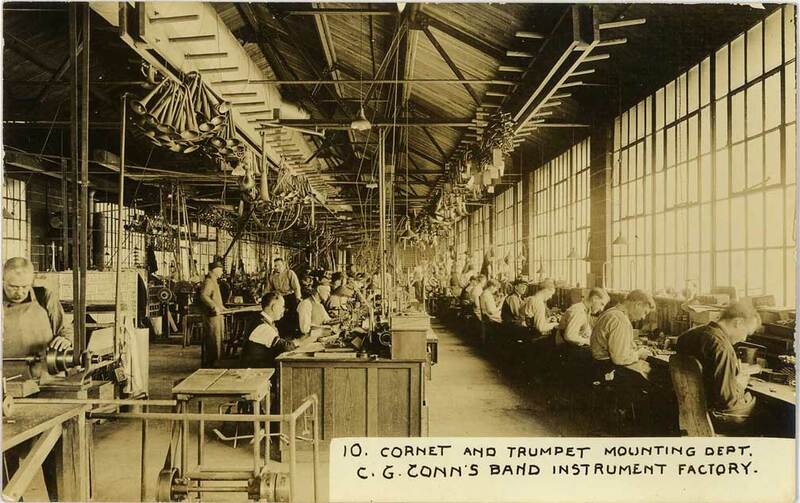 "C. G. Conn Band Instrument Factory"
Shown in numerical order, we thought we would share these very interesting images from the collection of Daniel Oberloh that depict the working environment at the Conn factory, early in the twentieth century. We have done our best to clean them up and resize them for better viewing. These images are from the post card series originally offered by C.G. 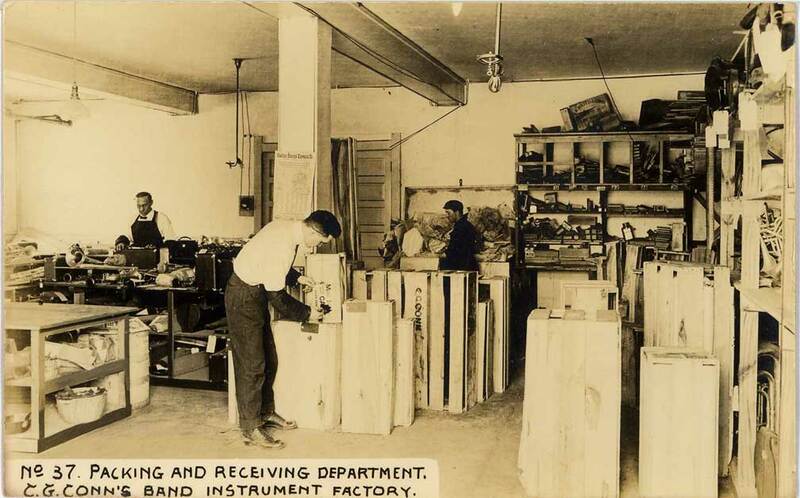 Conn of there newly built factory in Elk Hart Indiana c.1911. A big thank you to our friend James Reid for providing his collection of post cards and allowing us to display the complete set. A brand spanking new factory to replace the previous one that burned down. Creating band instruments requires a great number of special tools, forms and jigs. The Machining department is where most of the tooling is made to order. These are the machines that make parts like valve cap, stems and finger buttons. 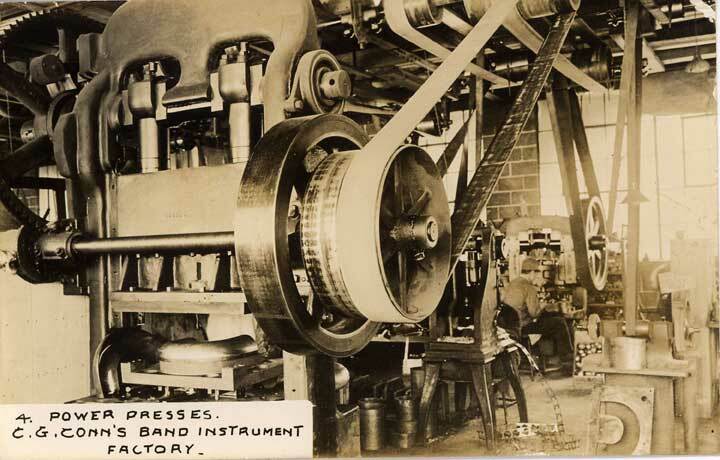 Back then, large presses were fitted with custom dies that stamped out sheets of brass into the rough parts of sub-assembled. This press is stamping out one of the half sections for a tuba bottom bow. Making mouthpieces, lots of mouthpieces. 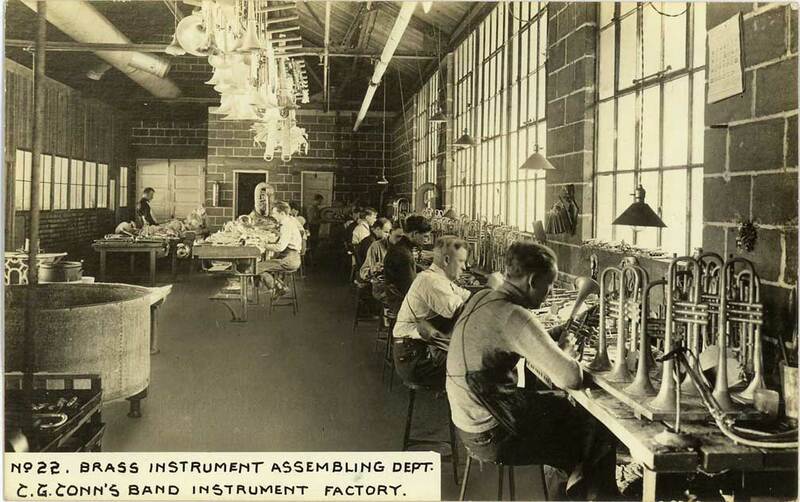 The "valve department", where many small pieces are made and put together creating the valve assemblies for all brass instruments. 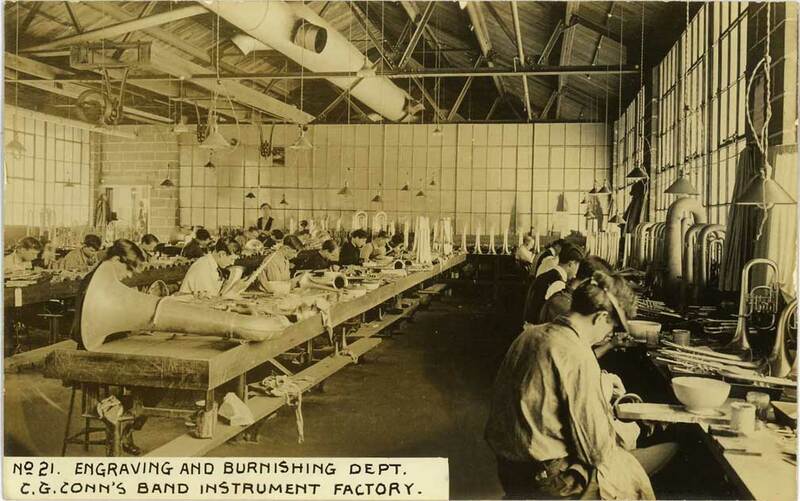 The "Bell Spinning department" is where brass instrument bells are formed on spinning-lathes. The process is one that calls for a high degree of skill. Assembling tubas, euphoniums,... all the big iron. Draw benches are used for extruding brass tubes to the desired size and taper. With the use of a large cheater-bar, the large lead filled branch of a helicon bass (marching tuba) is accurately bent to the proper radius. r Smaller branches, like those on french horns and baritones were also filled with lead and bent to the desired radius. The "Bending Department" is where large bows, branches and bells are. well bent. Seen here is where the ripples that occur during the process are hammered and burnished out. 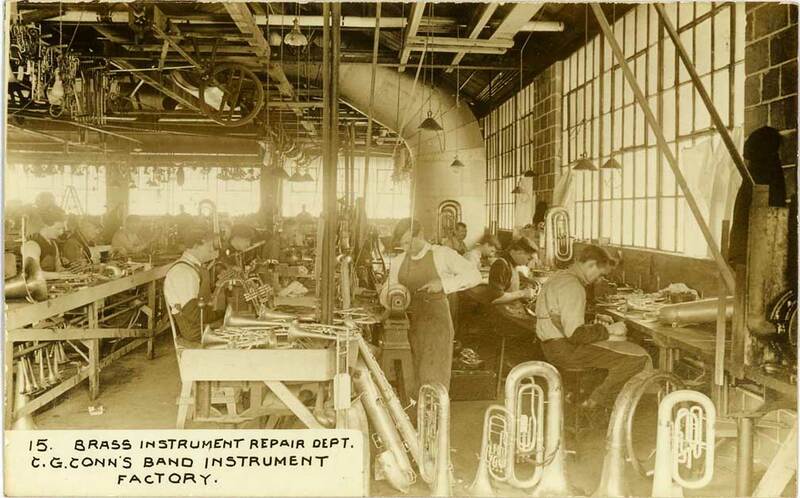 Unlike today when you have local repair and restoration shops (like Oberloh Woodwind and Brass Works), there was a time when getting a brass instrument repaired meant shipping it to a manufacturer in the mid Western US. Filling the branches and bells with lead keeps them from kinking during the bending process. Yup, they got to come from somewhere. Once it is together, it's ready for polishing. 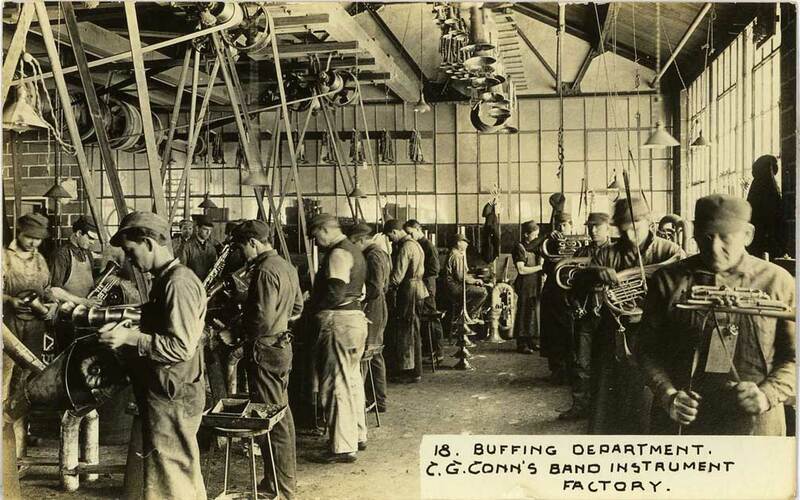 Here is a shot of the "Buffing Department". Very dirty work. Strapping horns is the process that polishes the brass in all the tight spots. Mmm' good times. After polishing and buffing instruments that are to be nickel, silver or gold are sent to the plating department. Back in the day, Conn had a huge engraving department that was always a bottle neck in the production. Unfortunately, this was cut back quite a bit when the new owners took over around 1917. Standing to the left in the back of the room looks to be Conn's famous engraver Julius Stenberg. And in the back right corner is most probably his brother Charles AKA Doc who worked at C. G. Conn nearly there entire lives (from the 1880s to the 1950s). Trumpets and cornets, Once all the parts are made its time to put them together. Many parts are cast from molten brass and nickel-silver. Parts like clarinet, bassoon and sax key levers as well as percussion and banjo hardware. 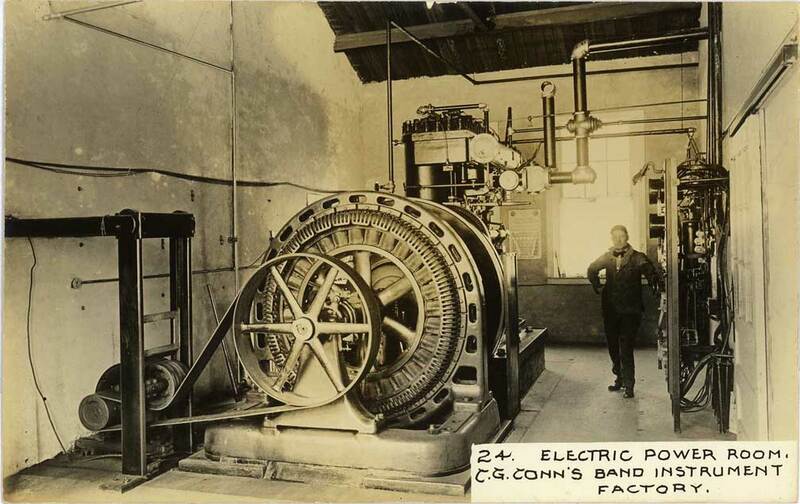 In 1911, electricity was still new and worth showing off. In winter time; warm and comfortable workers are happy workers. Boilers make steam, steam powers the generators that make the electricity that makes the machines go. Very modern... for 1911. How many manufacturers make there own cases today? Case shells, drum shells... Same dept. On the factory floor, Women in the work place???... Gasp! 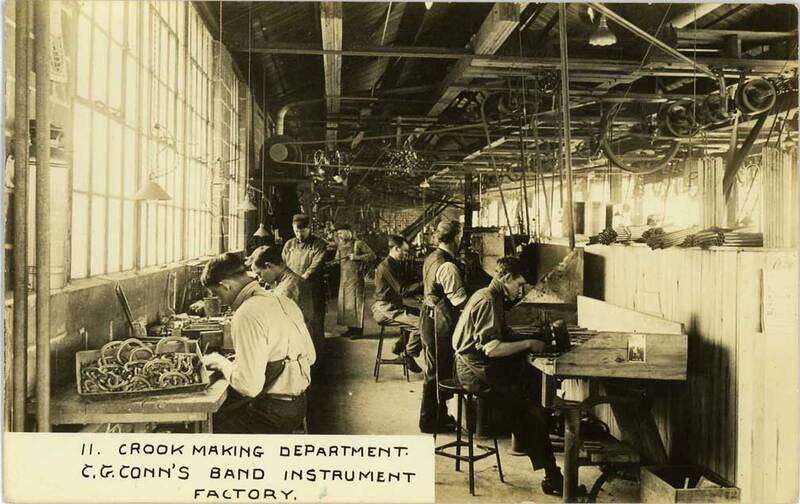 Compared to the rest of the factory, it looks like they were just dabbling in luthier work. Flute work is much cleaner. Clarinet work is too. I don't think I want to do brass anymore! That's it, I want to do woodwinds from now on! There dept. is nicer! What? I guess they found a real day gig . Testing? Looks pretty quite in there to me. We hope these images are of interest to our visitors. C.G. 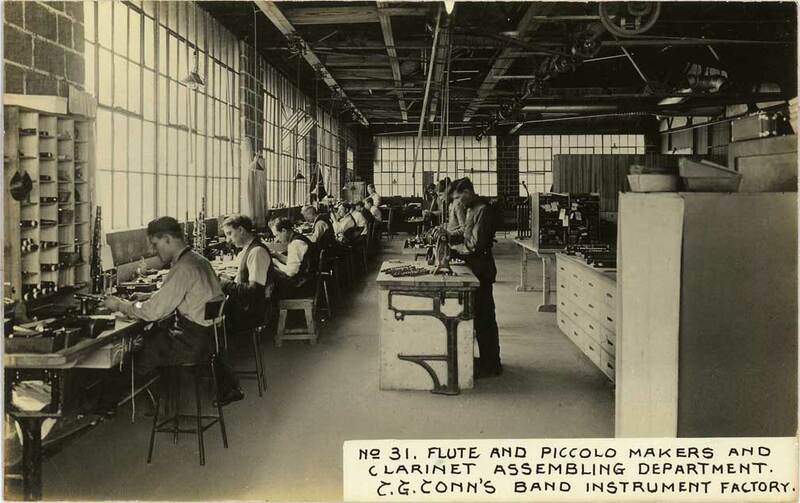 Conn, the oldest continuous manufacturer of band instruments in America, literally gave birth to the U.S. band instrument manufacturing industry. Today, C.G. Conn encompasses some of the greatest names in musical instruments - C.G. Conn, King and Benge brass instruments, Artley and Armstrong woodwinds and Scherl & Roth strings. Always committed to serving the needs of students, music educators, amateurs, and professionals, C.G. Conn's storied history reflects a dedication for innovation and quest for the ultimate in design and craftsmanship - an industry leader in musical performance. One Saturday night in 1873, Civil War veteran Charles Gerard Conn got involved in a brawl that resulted in a split lip. Not good news for a man who played cornet with the Elkhart, Indiana "Brick Brown Band." In order to get around this problem, Colonel Conn set out to perfect a special rubber-cushioned mouthpiece so he could continue playing. The new mouthpiece, which he later patented, caught the eye of other musicians. He made a few for his friends, but soon there was such a demand for his mouthpieces that he rigged up a lathe from an old sewing machine and began turning them out as fast as possible. In 1875, a French musical instrument maker named Dupont stopped by the shop and asked if he might use Conn's bench to repair some horns. After watching him work for several days, Conn decided that he, too, could make a horn. 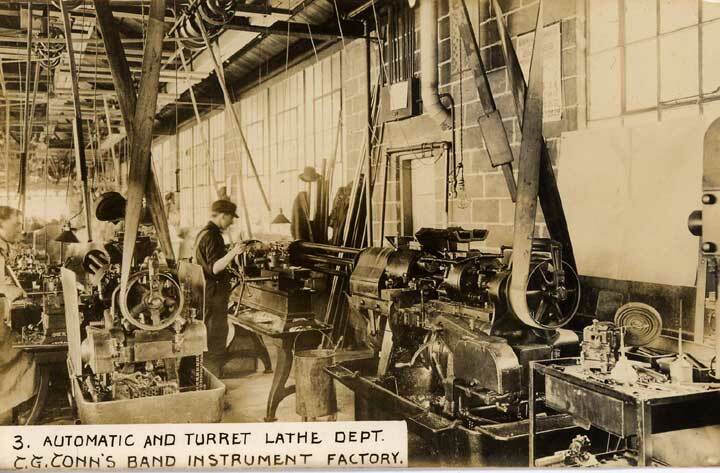 In that same year, in a closet-size shop only 20 feet square, Col. Conn produced the first American-built cornet. 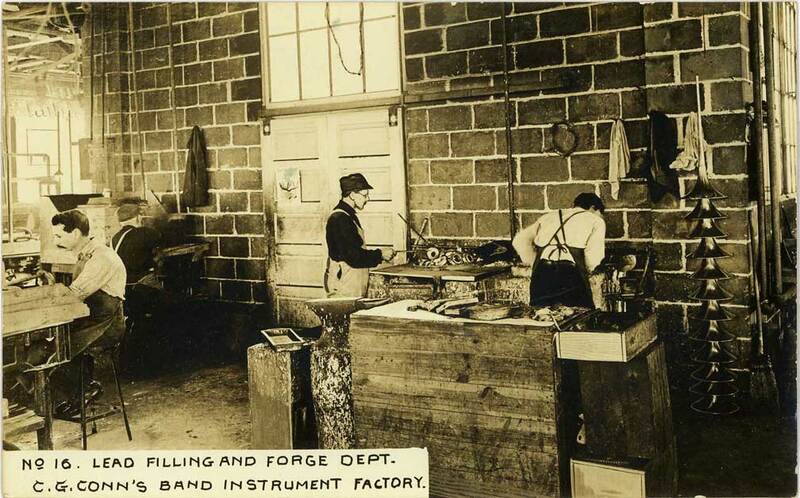 By 1879 the shop moved into larger quarters, and Conn began adding instruments to his line. 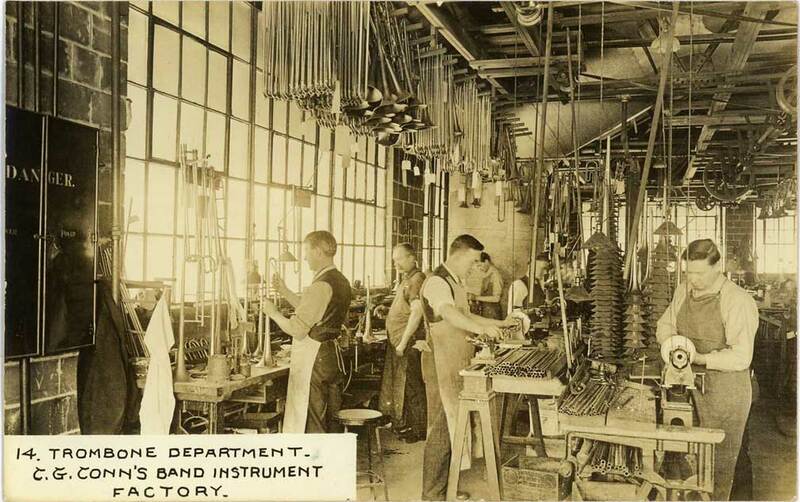 In 1888, Colonel Conn brought 15 European instrument craftsmen to the United States and gave them the space, the tools and the incentive to make the finest instruments their skills would allow. 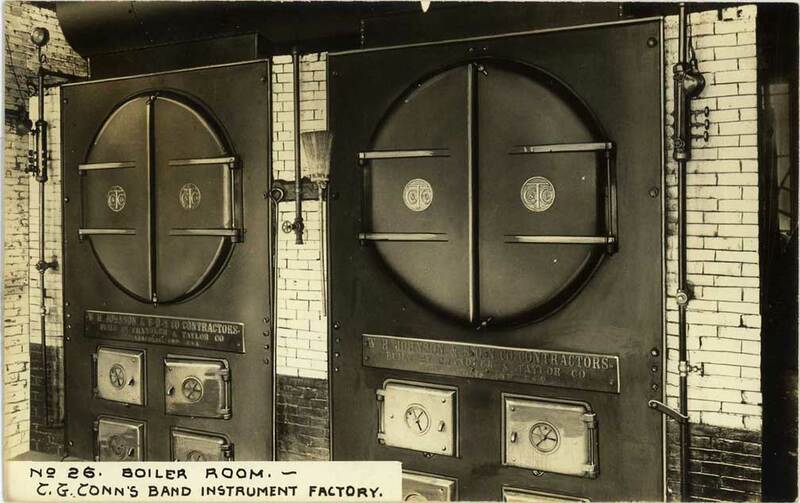 Their expertise, teamed with the Colonel's ingenuity and ambition, soon produced instruments so exceptional that they were accorded highest honors in the 1893 World's Columbia Exposition in Chicago. Twice the Conn plant burned to the ground. Twice it was rebuilt, bigger and better than before. 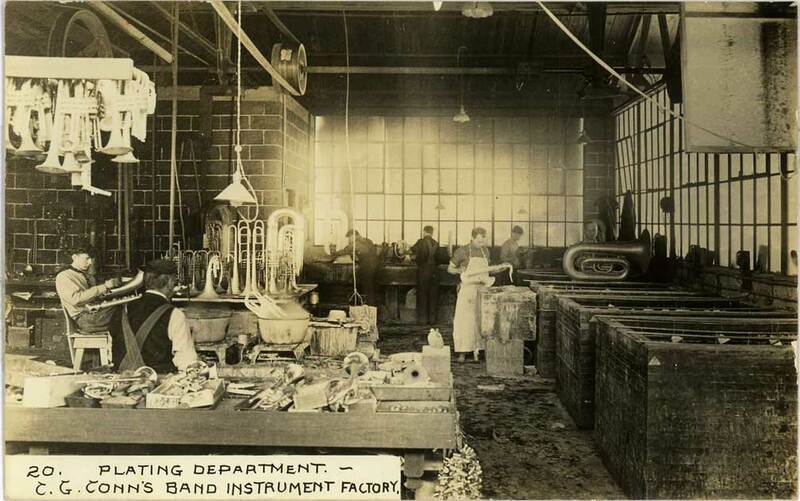 Famous bandmasters and musicians visited the plant and personally endorsed "Conn Wonder Instruments." John Phillip Sousa, Patrick Gilmore, Herbert Clarke, Arthur Pryor, A. Liberati and others were frequent visitors. Vaudeville was at its peak, and the theaters and music halls of Elkhart saw a steady procession of the finest bands and musicians of the day. All played the Colonel's instruments. Conn instruments - ornate and often jeweled - became world famous as Sousa and others toured Europe playing before kings, queens and czars. The Colonel also loved strange and bizarre instruments. In 1907 he built an Immensaphone, the largest horn in the world. It measured 12 feet in diameter and 35 feet long. 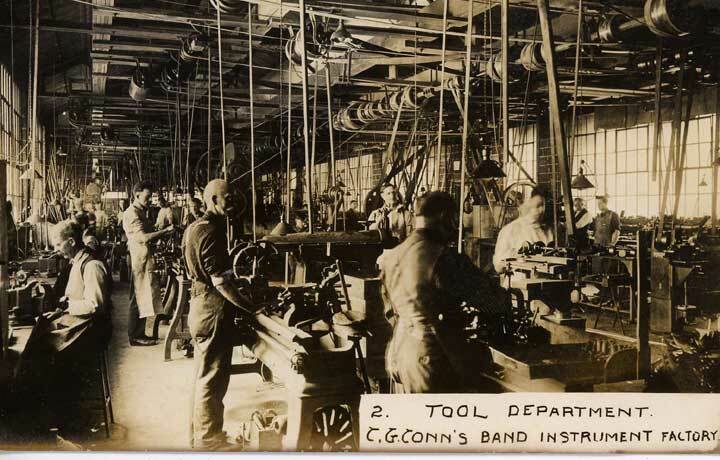 The Conn factory also built the world's largest drum, a slide tuba to make noises like a ship's warning whistle, tenor tubas for the jackass role in Strauss' Don Juan, and a saxophone for one-armed musician Al Miller. Since the first American cornet in 1875, C.G. 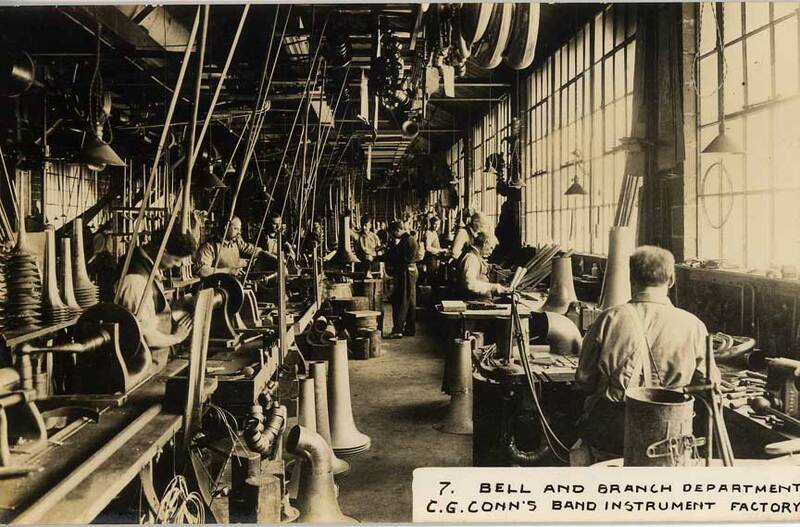 Conn continued producing "firsts" throughout its distinguished history: the first American saxophone, first double-bell euphonium, first sousaphone (built to the great Sousa's specifications), and a long list of many others. In 1915, Colonel Conn sold the C.G. Conn Company to C.D. Greenleaf. 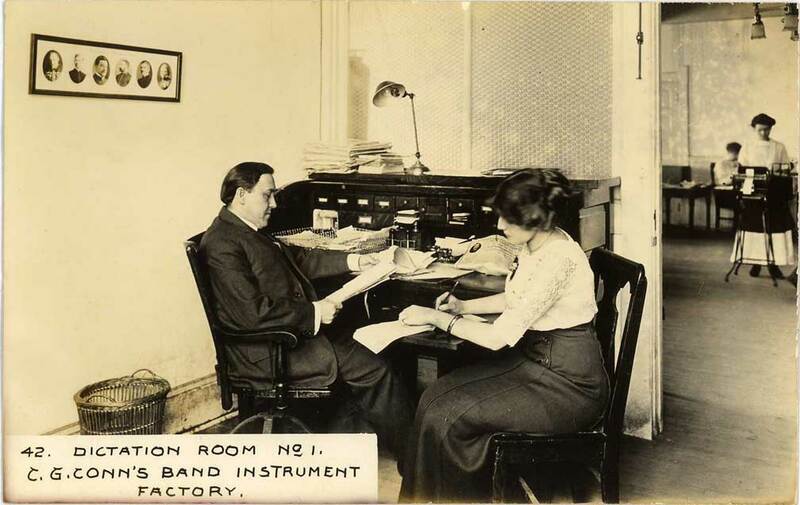 Greenleaf, almost clairvoyantly, realized a need for the advancement of instrumental music in the schools. His foresight and energy continued to add to Conn's innovations. He was responsible for founding the first national school for band directors, first and only center for the study of musical acoustics, first successful short action valves, first all-electronic organ and first fiberglass sousaphones, among other legendary advancements. 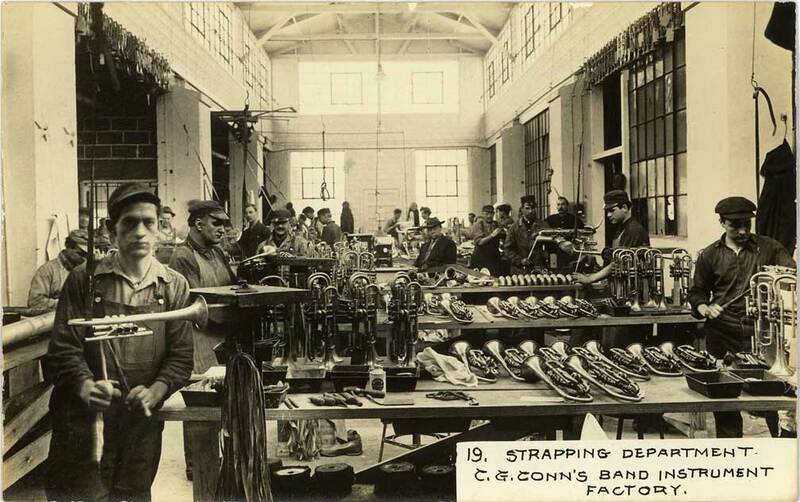 During World War II the Conn factory was completely converted to manufacture precision instruments for defense. 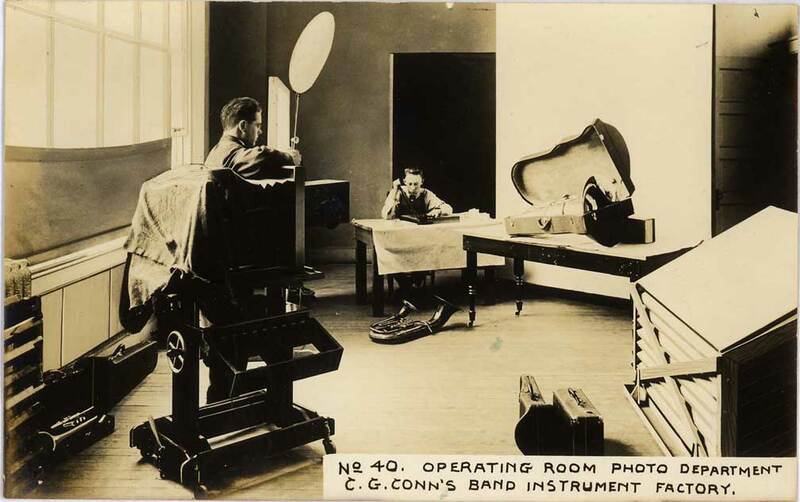 Conn received four Army-Navy "E" Awards - the first given in the band instrument industry. During the Korean War part of the facilities was converted to defense production, and Conn achieved another record in precision manufacturing. 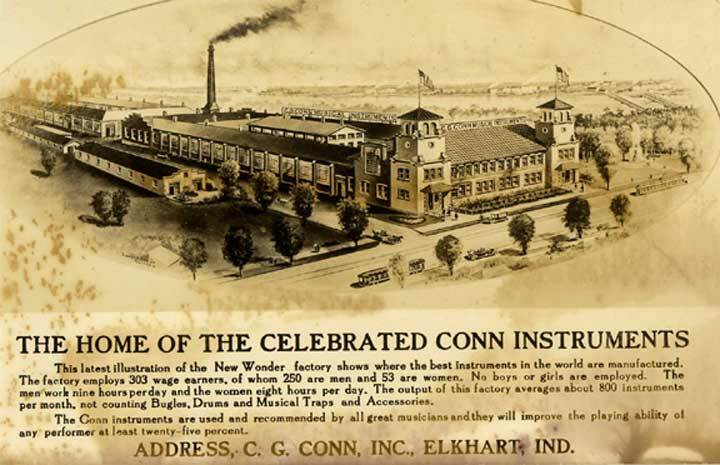 Many of today's most preferred instruments owe their original success to Conn's innovation. C.G. Conn French horns, for example, have been the horn of choice for the Hollywood film industry for most of the 20th Century. C.G. Conn Symphony Series trombones have a legendary place in the classical trombone world. Today's best trumpet players are discovering the break-through performance with Vintage One trumpets. These innovative designs, enhanced by superior craftsmanship and technological breakthroughs, have provided today's musicians with the superior instrument performance. Building on the proven designs of the past, C.G. Conn continues to meet the demands of today's best musicians. 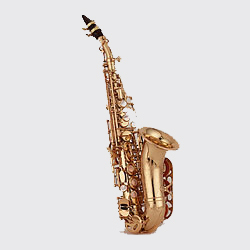 As well, amateur and student musicians can enjoy the very best in instrument technology and performance with brass instruments and saxophones from C.G. Conn.
Charles Gerard Conn. The company was founded by Charles Gerard Conn (b. Phelps County [disambiguation needed ], New York 29 January 1844; d. Los Angeles, California 5 January 1931). In 1850 he accompanied his family to Three Rivers, Michigan and in the following year to Elkhart, Indiana. Little is known about his early life, other than that he learned to play the cornet. With the outbreak of the American Civil War he enlisted in the army on 18 May 1861 at the age of seventeen, despite his parents' protests. On 14 June 1861 he became a private in Company B, 15th Regiment Indiana Infantry, and shortly afterwards was assigned to a regimental band. When his enlistment expired he returned to Elkhart, but re-enlisted on 12 December 1863 at Niles, Michigan in Company G, 1st Michigan Sharpshooters. At the age of nineteen on 8 August 1863 he was elevated to the rank of Captain. During the Assault on Petersburg on 30 July 1864, Conn was wounded and taken prisoner. In spite of two imaginative and valiant attempts to escape, he was recaptured and spent the remainder of the war in captivity. He was honorably discharged on 28 July 1865. 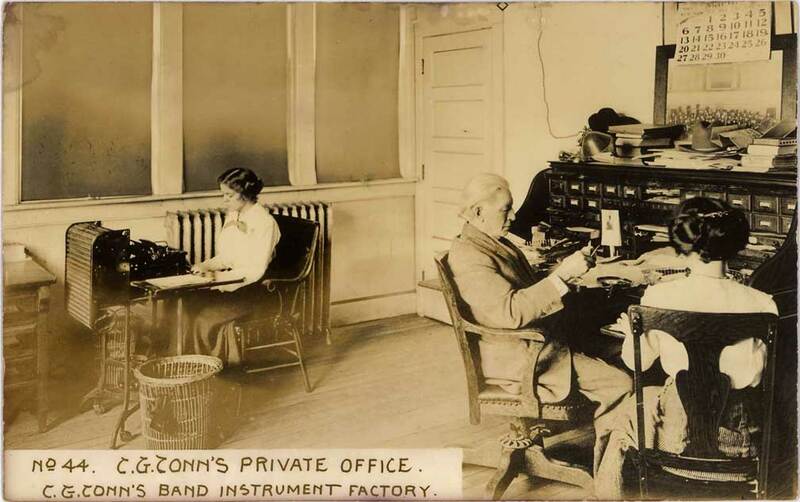 Founding of Conn's band instrument manufactory After the war, Conn returned to Elkhart and established a grocery and baking business. He also played cornet in the local community band. 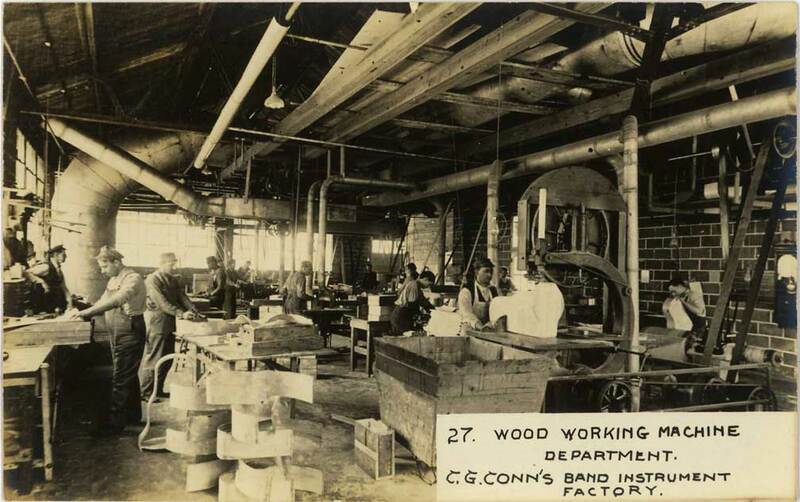 Conn's entrance into the musical instrument manufacturing business was the result of a split lip. There are three existing stories of how this occurred, but the popularly accepted version is that Del Crampton slugged him in the mouth outside a saloon where both of them had been drinking. Conn's upper lip was severely lacerated, and it pained him so to play his cornet that he thought his playing days were over. In addition to running his store, Conn also made rubber stamps and re-plated silverware. He decided to try adhering rubber stamp material to the rim of a mouthpiece which he hoped would conform to his lips. After he showed his friends his idea, he realized that there was tremendous demand for his invention. Conn then began to contemplate manufacturing his new mouthpiece. He needed a rim with a groove which the rubber cement would adhere to more easily. It was in 1874 when Conn converted a discarded sewing machine frame into a simple lathe and started to turn out his mouthpieces and was soon in full production (Subsequently Conn and Del Crampton became best of friends, and when Conn embarked on his political career, he was a staunch advocate of temperance). Conn patented his rubber-rimmed mouthpiece in 1875 (with patents to follow through 1877) described as "an elastic face [i.e., a rubber rim] where the mouthpiece comes in contact with the lips, the object being to prevent fatigue and injury to the lips." About this time Conn met Eugene Victor Baptiste Dupont (b. Paris ?May 1832; d. Washington, D.C. 26 July 1881), a brass instrument maker and designer and a former employee of Henry Distin of London. In January 1876, Conn joined with Dupont under the name of Conn & Dupont, and Dupont created Conn's first instrument, the Four-in-One cornet, with crooks allowing the horn to be played in the keys of E♭, C, B♭, and A. By 1877Conn's business had outgrown the back of his grocery store, and he purchased an idle factory building on the corner of Elkhart Avenue and East Jackson. 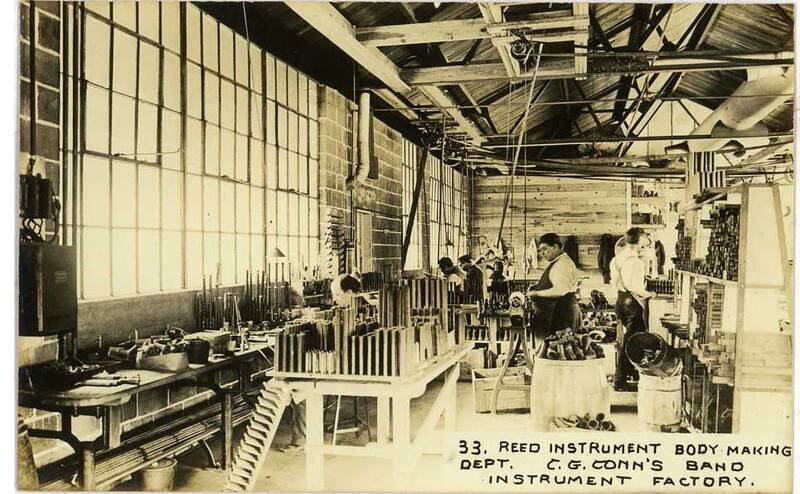 Conn's partnership with Dupont was dissolved by March 1879, but he was successful in attracting skilled craftsmen from Europe to his factory, and in this manner he expanded his operation so that by 1905, Conn had the world's largest musical instrument factory producing a full line of wind instruments, strings, percussion, and a portable organ. Conn partnered with Albert T. Armstrong, Joseph Jones, and Emory Foster to manufacture a twin-horn disc phonograph called the 'Double-Bell Wonder' that was produced in two iterations briefly in early 1898 before a lawsuit by the Berliner Gramophone Company caused production to cease. Brick-red 'Wonder' records were also pressed for the 'Double-Bell Wonder' talking machine by the Scranton Button Works from pirated Berliner masters. Fewer than fifty 'Double-Bell Wonders' were produced of both iterations combined. Conn's first factory was destroyed by fire 29 January 1883 (his thirty-ninth birthday), and he erected a new building on the same site. 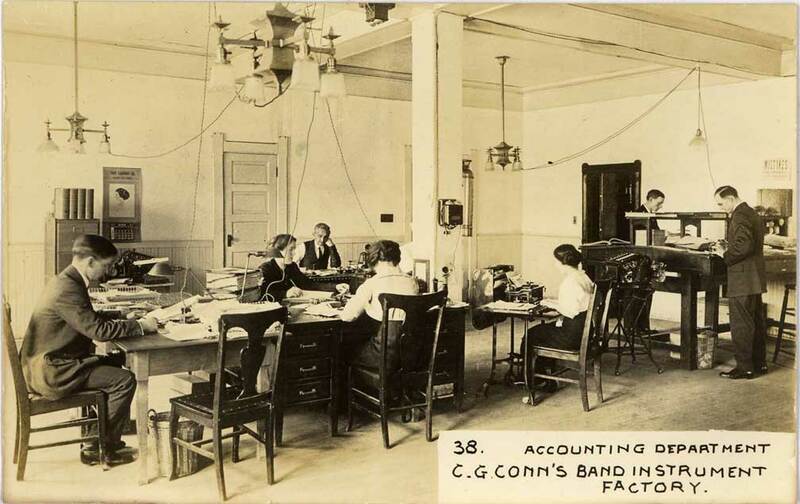 In 1886 rumors began to circulate that Conn wanted to move his business to Massachusetts. Conn was induced to stay after the public raised a large sum of money by popular subscription and gave it to him. 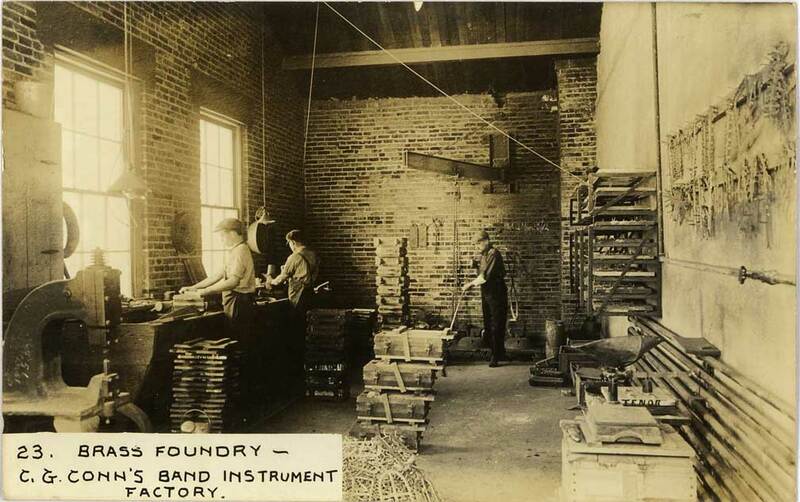 In 1887 Conn purchased Isaac Fiske's brass instrument manufactory (upon Fiske's retirement) in Worcester, Massachusetts. Fiske's operation was considered to be the best in its time. Conn operated it as a company subsidiary, and in this way he achieved his objectives. The company's product line now centered around the 'Wonder' cornet, but in 1885 Conn began importing French clarinets and flutes. 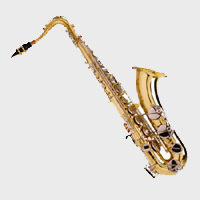 Conn claims to have introduced the first American-made saxophone in 1888, designed by the French-born E.A. Lefebre, well known soloist with both Patrick Gilmore's and John Philip Sousa's bands. 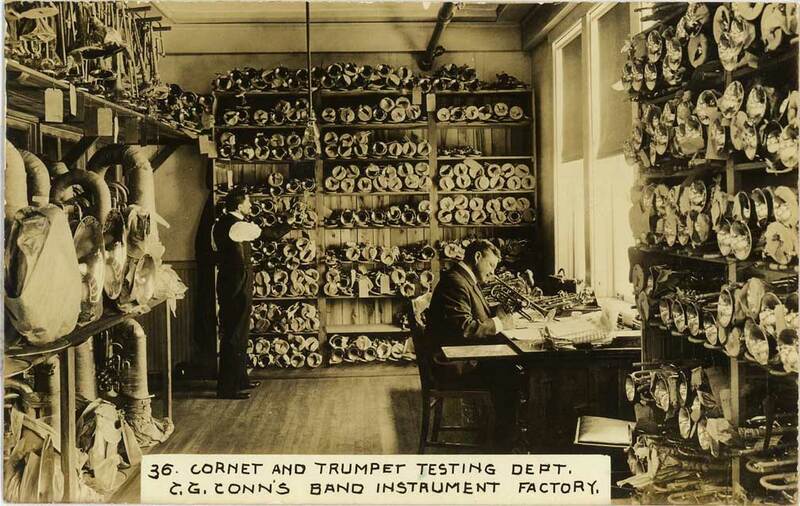 Conn's instruments were endorsed by several leading band directors, including Sousa. In 1898, upon the suggestion of Sousa, Conn developed the first commercially successful bell-up sousaphone ("the rain-catcher"). 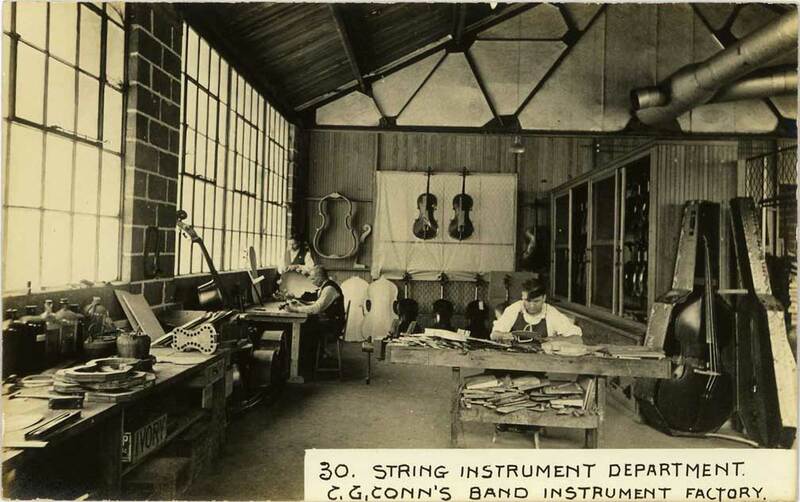 Conn phased out the Worcester operation (production was ceased in 1898), and Conn established a store in New York City (1897–1902) which a large variety of merchandise was sold under the 'Wonder' label, which included Conn-made woodwind, brass and percussion instruments, violins, mandolins and portable reed organs. 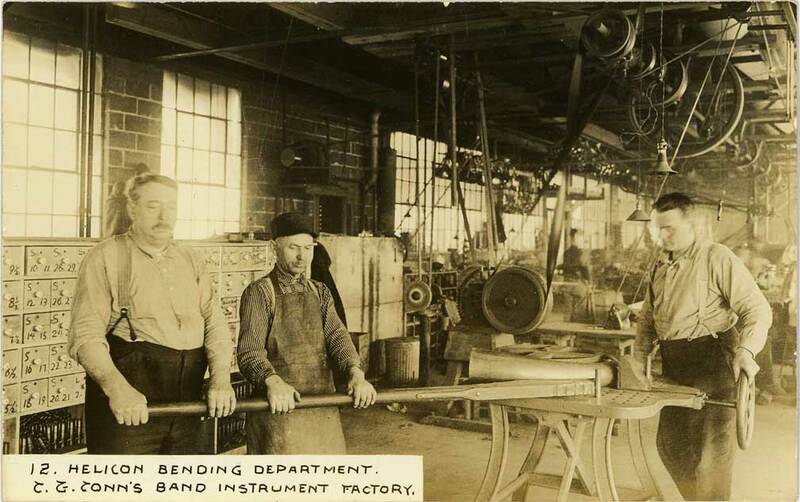 The business also distributed American-made and imported guitars, banjos and zithers. Conn's other enterprises Colonel Conn was a colorful personality of the show biz sort. He believed that he could do anything. His career grew far beyond the confines of horn making. In 1880 Conn was elected Mayor of Elkhart on the Democratic ticket. He was re-elected in 1882 but did not finish the term. Ten days before the general election in 1888, Conn was drafted as an emergency candidate for the Indiana House of Representatives by the Democrats, and won the election. In 1892 he was elected to the United States Congress as Representative of the 13th District of Indiana. Two years later he was re-nominated, but declined the nomination unless the party permitted him to make the canvass on a "reformed" platform. The party would not permit this, and accepted his declination. In 1908 he ran for Governor of Indiana and lost; in 1910 he ran for Senator. Colonel Conn had heavily invested money in other businesses. One of his disappointments was his involvement with early electrical generating systems. In 1904 he constructed a powerhouse and provided electrical service as a competitor to the Indiana and Michigan Electric Company. They later bought out Conn's service at a great sacrifice to himself. The turning point to Conn's financial affairs and public life took place in April 1911 when he and his wife executed a trust deed for $200,000 covering all their possessions for the purposes of bonding the Conn indebtedness and securing working capital, the longest bond to mature in ten years. Conn's money problems stemmed partly from failed adventures like his entry into the utilities business, the building of his third factory, and its loss to fire, and his loss of a costly lawsuit filed against him by a former company manager. The deed included in addition to the horn factory and what was then known as the Angledile Scale Company, and The Truth, some sixty descriptions of real estate in Elkhart and vicinity, various real estate mortgages, 125 shares of stock in the Simplex Motor Car Company of Mishawaka, Indiana, a seagoing yacht, a lake motor launch, and much valuable personal property. Carl D. Greenleaf and C.G. Conn, Ltd. In 1915 all of Colonel Conn's holdings were bought by a group of investors led by Carl Dimond Greenleaf (b. Wauseon, Ohio 27 July 1876; d. Elkhart, Indiana 10 July 1959). Conn met Greenleaf during his years in Washington, D.C., and invested in some grain mills in Ohio which Greenleaf owned. Initially Conn held onto ownership of The Truth, but a few months after the sale of his other holdings, Conn sold The Truth to Greenleaf and to a local entrepreneur Andrew Hubble Beardsley. Greenleaf incorporated his new holdings under the name C.G. 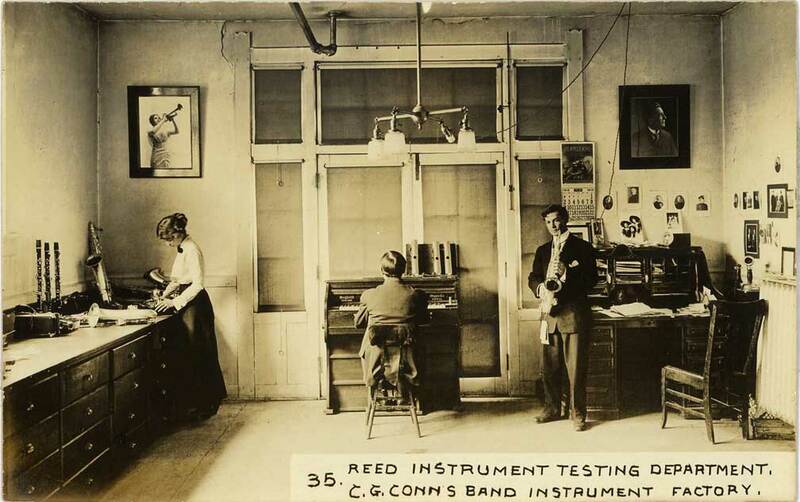 Conn Ltd. and retained the Conn trademark on his musical instruments. The sale was detrimental to Colonel Conn's marriage. They divorced, and Mrs. Conn was allowed to retain a house in Elkhart in which she lived until her death in 1924. Colonel Conn meanwhile was allowed to keep his home in Los Angeles, California. He spent virtually the remainder of his life there and only returned to Elkhart once in 1926 to visit his sister. He remarried to a very young woman while in California, and she bore him a son twelve years before his death in 1931. Once a very wealthy and influential man, he died almost penniless. His estate didn't have enough money in it to afford a grave marker, and a hat was passed around the horn factory to collect enough money to buy one. Carl Greenleaf was president of Conn from 1915 to 1949. He was an astute businessman, yet he was also very sensitive to the market trends of the industry. While president, Greenleaf was noting the gradual extinction of the small town brass band, and also the big touring bands such as the Sousa band were also in decline. He knew that in order for the industry to survive, band programs had to be promoted in schools and colleges. He succeeded to develop a close relationship and communications between the industry and music educators. With the help of educators such as Joseph E. Maddy and T.P. 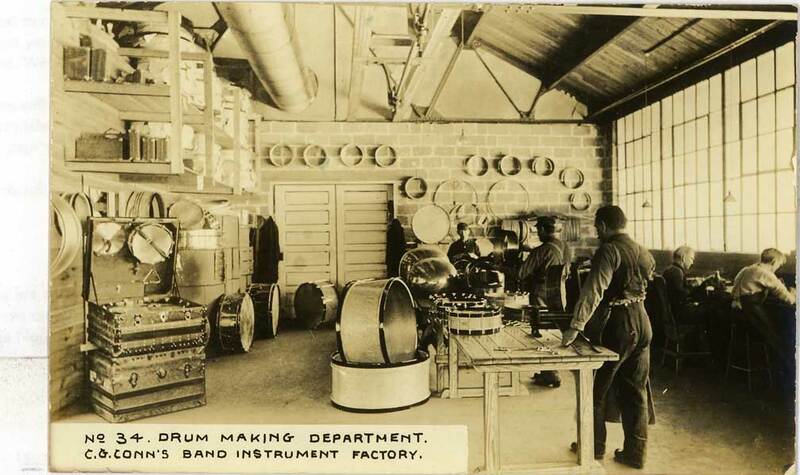 Giddings, they helped introduce band music into the schools. Greenleaf organized the first national band contest in 1923 and helped make possible the founding of the National Music Camp at Interlochen, Michigan. In 1928 he founded a Conn National School of Music which trained hundreds of school band directors. The whole industry blossomed because of his foresight, and we must credit Greenleaf for being the prime initiator of the development of the instrumental programs in our schools and communities we now enjoy. Greenleaf expanded, upgraded and retooled the plant, and he converted the company from a mail-order business to one operated through retail dealers. 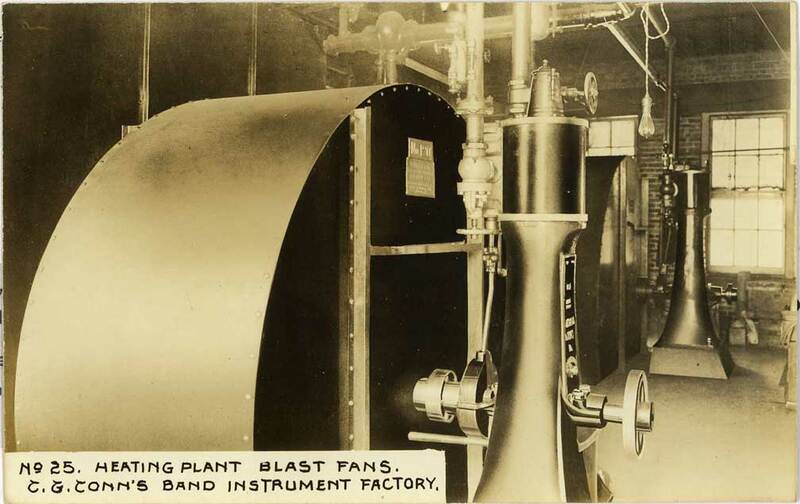 By 1917 the assembly-line work force had increased to 550 employees who were turning out about 2500 instruments a month using a new hydraulic expansion process which Greenleaf introduced to the plant. 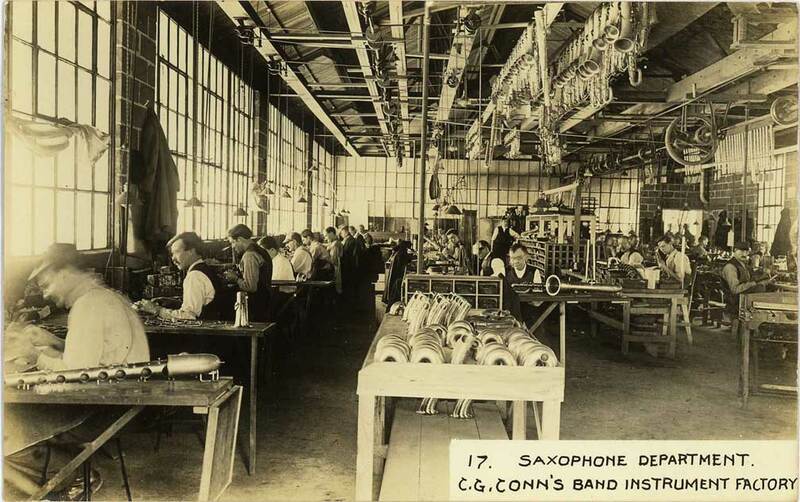 In the 1920s Conn was producing a complete line of saxophones. In this area they had stiff competition by other big saxophone makers such as Buescher and Martin. In the late 1920s Conn attempted to introduce a mezzo-soprano saxophone in the key of F and the 'Conn-o-sax', a saxophone-English horn hybrid, to capture more of the saxophone market, but these instruments were soon discontinued after flagging sales. Around 1919 Conn introduced the first drawn and rolled tone holes (after a patent by W.S. 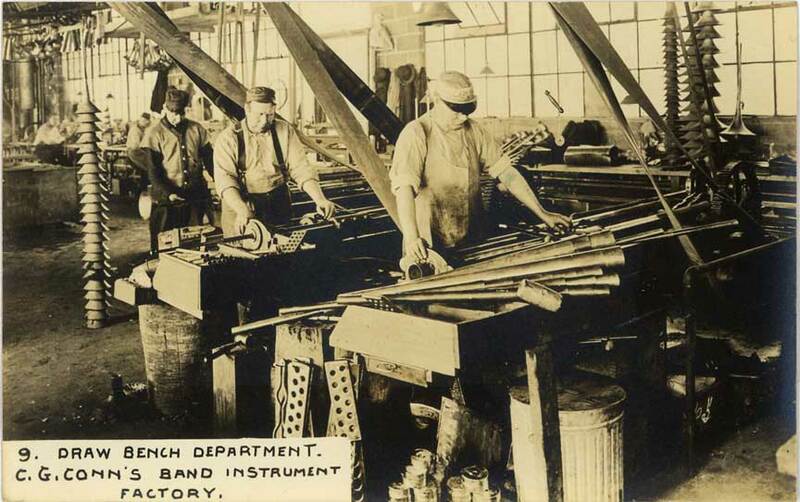 Haynes in 1914) eliminating the necessity of soft-soldering tone hole platforms onto the bodies of the instruments. 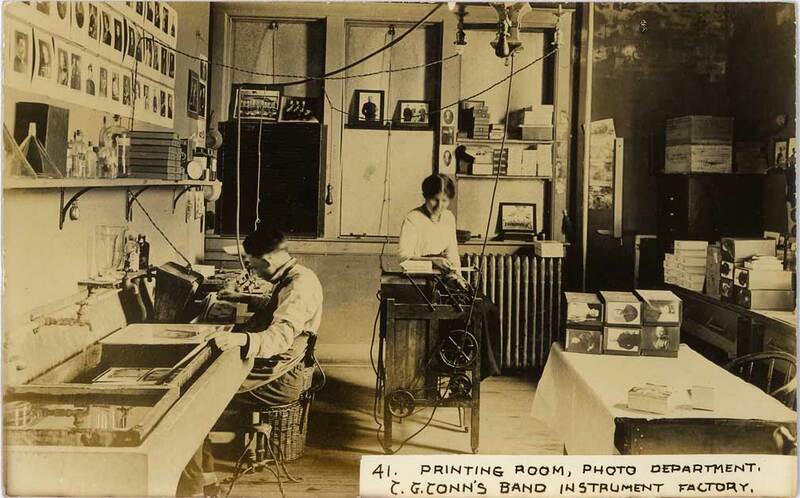 In 1928 Conn opened its Experimental Laboratory which was unique in the industry. It was under the direction of C.D. 's son Leland Burleigh Greenleaf (b Wauseon, Ohio 12 August 1904; d Leland, Michigan 29 March 1978), and under his directorship, the department developed the first short action piston valves (1934), and the 'Stroboconn' (1936), the first electronic visual tuning device. The 'Vocabell' (1932) was a bell with no rim to optimize the sound. It also developed the 'Coprion' bell (1934), a seamless copper bell formed by directly electroplating it onto a mandrel. 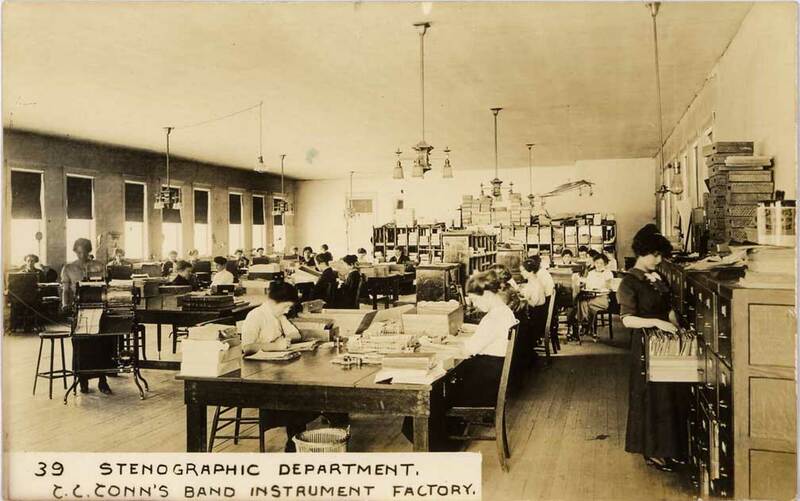 During the 1920s Conn owned the Elkhart Band Instrument Company (1923-7), the Leedy Company (1927–55), a manufacturer of percussion, 49.9% of the stock of H. & A. Selmer (1923-7), and two subsidiaries, the Continental Music Company and the Pan American Band Instrument Company, (which had been founded and owned by Greenleaf). 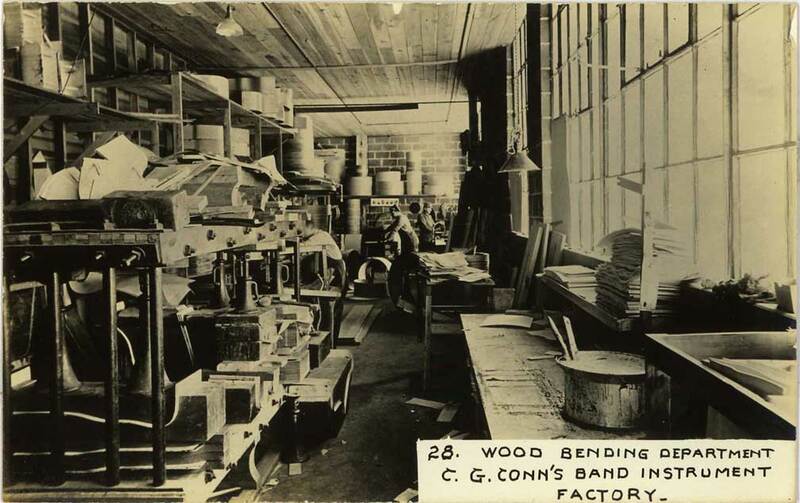 Despite the stock market crash of 1929, Conn purchased several companies (1929–30) including Ludwig and Ludwig, a maker of percussion, and Carl Fischer and Soprani, makers of accordions. From 1940 to 1950 they owned the Haddorff Piano Company, and from 1941-1942 the Straube Piano Company. 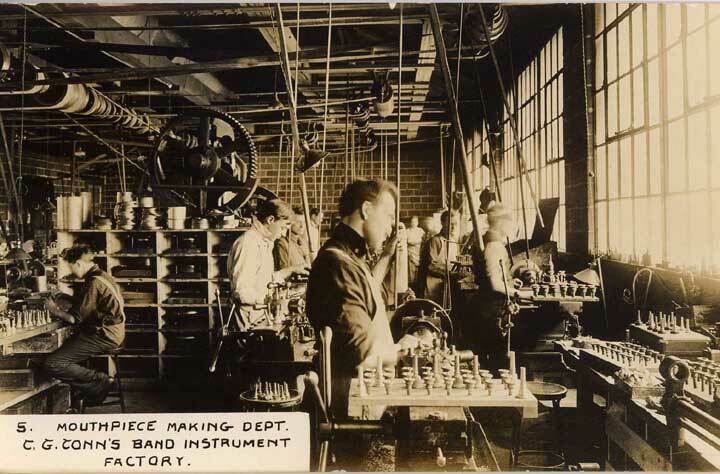 During the war period from 1942 to 1946, Conn ceased all production of musical instruments for civilian use to manufacture parts for the government. 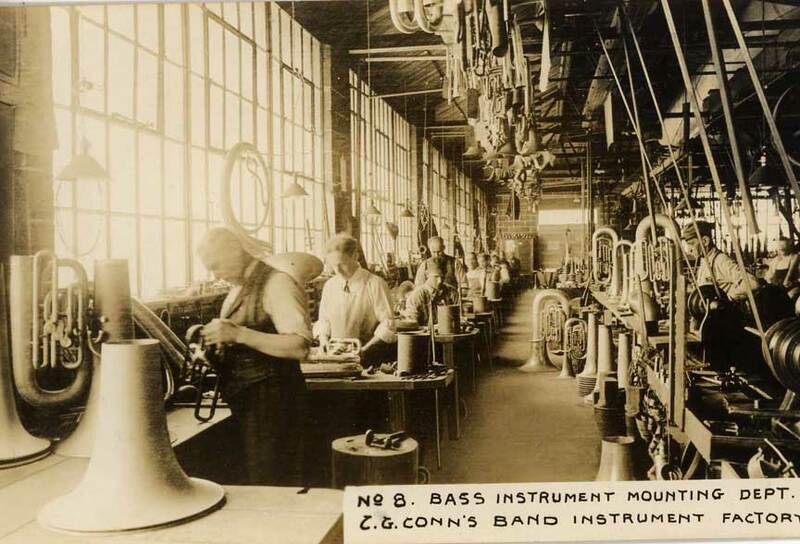 The resulting loss of sales and the delayed conversion of the plant in 1946 caused a serious decline in Conn's status as a major band instrument manufacturer. In contrast to this, the Division of Research, Development and Design, under the directorship of Earle Kent (b Adrian, Texas 22 May 1910; d Elkhart 12 January 1994) continued to be a major force in industry technology. They developed the 'Connsonata' electric organ (1946; later known as the Conn organ), the 'Connstellation' line of brass instruments (mid-1950s), and the first fiberglass sousaphone (1960). 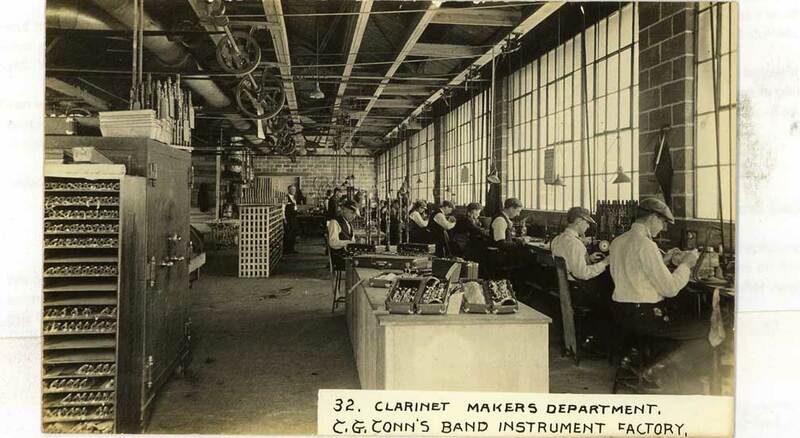 During this time Conn liquidated several of its subsidies including the Leedy and Ludwig Drum division (1949–1955), and the New Berlin Instrument Company (1954–1961) of New Berlin, New York which produced Conn's clarinets, oboes and bassoons. Carl Greenleaf retired in 1949 but remained a member of the board of directors until his death in 1959. He was eventually succeeded by his son Lee Greenleaf, mentioned previously, who had joined Conn in 1928 as an assistant engineer. He was company treasurer in 1953, vice-president in 1955, president (1958–1969), and chairman of the board (1967–1969). During his tenure Conn bought the Artley Company (1959), a manufacturer of flutes, the Janssen Piano Company (1964), and the Scherl & Roth Company (1964), a manufacturer of stringed instruments. In 1956 Conn sponsored a film to promote school bands entitled Mr. B Natural, which later generations would watch as an example of period kitsch and featured on the 1990s TV show, Mystery Science Theater 3000. Company from 1969 to 2002. In 1969 C.G. 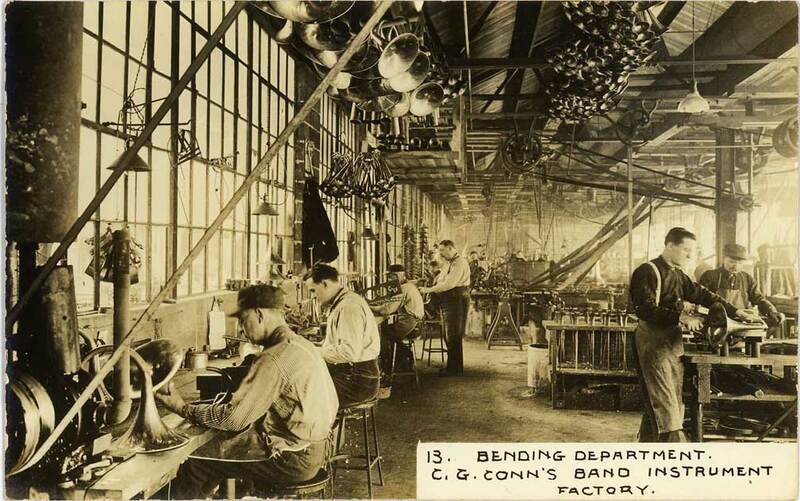 Conn Ltd. was sold to the Crowell-Collier MacMillan Company. 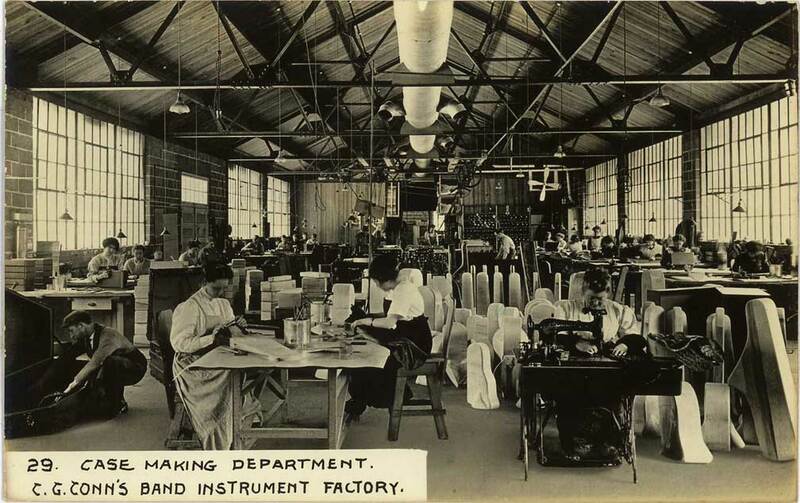 Under their ownership the company's prestige declined further, because of company executives in charge who were not familiar with instrument manufacturing and their customers, and as a result of a sales force who knew nothing about what they were selling. By 1970, high costs, competition and union labor pressures forced the company into drastic measures. 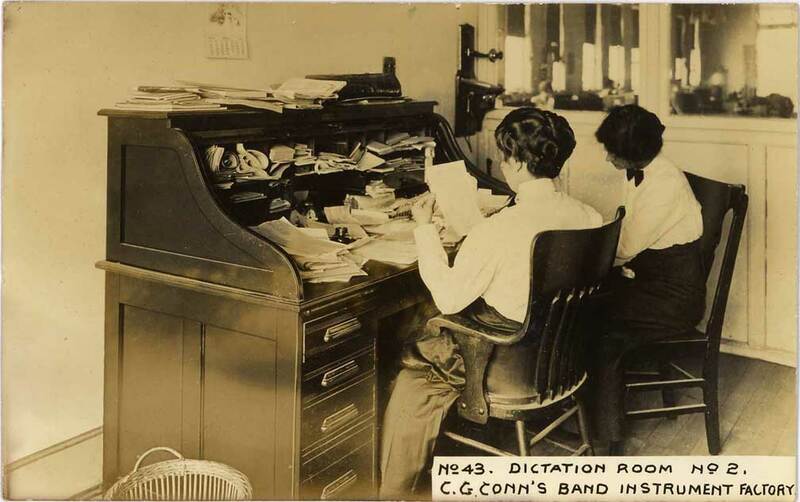 In that year the corporate offices were moved to Oak Brook, Illinois, and during the following year the Conn Organ Division was moved to Carol Stream, Illinois, the woodwind manufacturing to Nogales, Arizona (formerly the Best Manufacturing Company (saxophones), a maker of student-line saxophones purchased by Conn in the 1960s), and all student-line brass instrument manufacturing to Japan by Yamaha. Also in that year, the newly-introduced Conn Guitar Division, operating out of Oak Brook, Illinois, began contracting the manufacture of a new line of acoustic guitars to Tokai Gakki in Japan. The acoustic guitar business continued production until 1978. In 1979, Conn tried to enter the highly competitive electric guitar market—introducing a line of some original model electric guitars, and some copies of existing popular brands, but abandoned this venture by mid-1980 (see History of Conn Guitars). In 1980 the company was sold to Daniel Henkin (b. Kansas City, Missouri 1930) who had served the company as an advertising manager. In that year Henkin sold the organ division to Kimball under the name of Conn Keyboards. In 1981 he bought the W.T. Armstrong Company, a manufacturer of flutes, and in 1985 King Musical Instruments of Eastlake, Ohio. In 1986, the Swedish conglomerate Skâne Gripen was heavily invested in off-shore oil drilling and saw that it needed to diversify its holdings. 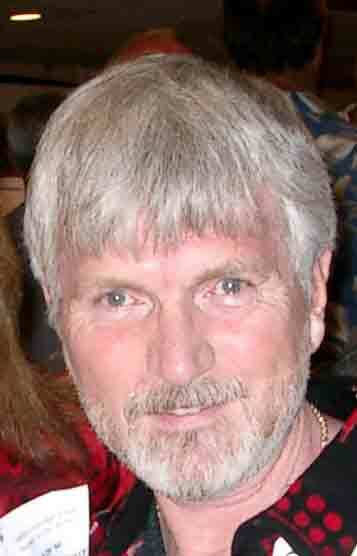 Skâne Gripen bought Conn in 1986 and created a new parent corporation, United Musical Instruments. UMI subsequently closed the Conn Brasswind facility in Abilene, Texas (1986), moving some brass instrument production to the old King plant in Eastlake. 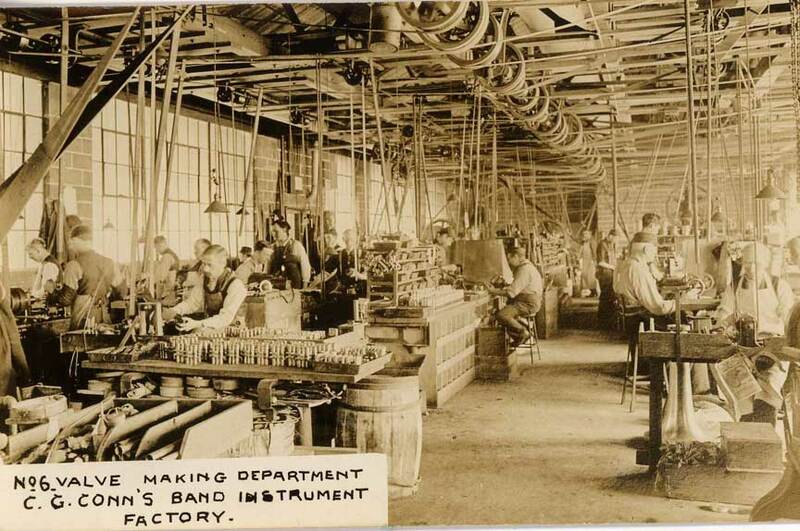 All operations were moved out of Mexico (1987); the production of Artley Flutes and Piccolos returned to Elkhart, while Clarinet, Saxophone and Small Brass Manufacture were moved to Nogales, Az. In 2000, UMI was purchased by Steinway Musical Instruments, and in January 2003 the UMI assets were merged with The Selmer Company to create Conn-Selmer, a subsidiary of Steinway Musical Instruments.